Hydrogen peroxide gel is a way to get hydrogen peroxide to stick. For example, you can use peroxide gel to stick on a cut on your leg, or to stick on to the skin on a horse’s neck. A finger of a foot is easy enough to soak in hydrogen peroxide. But, a neck or a thigh is not so easy to soak in peroxide. So, that is where gel is useful, if you need the peroxide to stay on for longer. 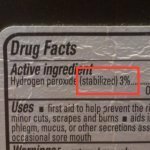 This page includes a recipe for 3% hydrogen peroxide gel, and info about Zim’s hydrogen peroxide gel – which you can buy if that seems easier to you. Why a sticky peroxide gel? Sometimes there are applications where peroxide would work well, but liquid really won’t do well, because it won't stay on long enough for some jobs. You can soak your finger in peroxide, but it’s hard to soak your neck in peroxide, or your ear. A gel form of peroxide is one way to get around this. It is easy to glob a bit of peroxide gel on your neck or your ear. You may even want to use it on your finger instead of soaking your finger. Gel gives you another option. Hydrogen peroxide works over time. If you put peroxide on a cut on your finger, it will be in contact with the cut for a short time. The liquid will run off, or will dry. In some cases this will be the right amount of time, but it is not long. The peroxide will have some effect, but only during the time of contact. If you put hydrogen peroxide gel on the same cut, it will be in contact for a much longer time. The gel doesn’t roll off, it is gunky, so it stays on much longer. The longer peroxide is in contact, the longer it is working. How “strong” peroxide is depends on both the concentration of the peroxide (for example “3%”) and how long it is in contact. You don't want the gel to stay on longer than it is needed, but you do want it to stay on long enough to disinfect. I’m wondering if hydrogen peroxide gel might also be useful for cleaning some kinds of objects, but I haven’t tried it. Maybe for a moldy statue? Or shower walls. Although you could soak a moldy statue in liquid hydrogen peroxide, it would be really difficult – it would take a lot of peroxide and a huge container of some kind. Not easy. A gel might be an option. Another option would be scrubbing it with sodium percarbonate paste, which I think I would try first…. Hydrogen peroxide gel is made by taking concentrated hydrogen peroxide and mixing it with sticky stuff. The peroxide gets diluted (because you are mixing it with sticky stuff). It’s a bit like mixing concentrated peroxide with water, but, instead of turning it into a diluted liquid, we are turning it into a diluted gel. The mixing proportions are the same as with water – 1 part 35% hydrogen peroxide mixed with 11 parts other ingredients will yield a 3% hydrogen peroxide mixture. Here’s more about diluting concentrated peroxide with water. The ingredients and proportions in this recipe are adapted from the booklet “Hydrogen Peroxide” by Conrad LeBeau. I’ve rewritten the directions, but kept the proportions of aloe vera gel and glycerin the same. 1 and ½ cups plain aloe vera gel (available at some drug stores). This should be a thick paste, and should NOT the thinner liquid aloe vera liquid that people drink. Continue to stir the mixture. It will become thin and liquidy for a while. Keep stirring and it will thicken. Scrape the sides of the bowl, so that everything is well mixed. Scoop the mixture into clean jars, and label them “3% hydrogen peroxide gel”. Keep refrigerated if you will be storing it for a long time. It’s fine to keep some at room temperature. Keep the jar covered, or it will dry out! If you wish, you can adjust the amount of glycerin to make the gel stickier (and decrease the aloe vera). You can also reduce the amount of hydrogen peroxide to make a 1% or 2% gel. If you’d rather just buy some peroxide gel, you’re in luck. Zim’s crack crème with hydrogen peroxide is 3% hydrogen peroxide, and 97% “inert ingredients”. Hydrogen peroxide can sting. Be especially cautious if you are using it on an animal or a child. You can use a weaker gel (like 1%), for example.